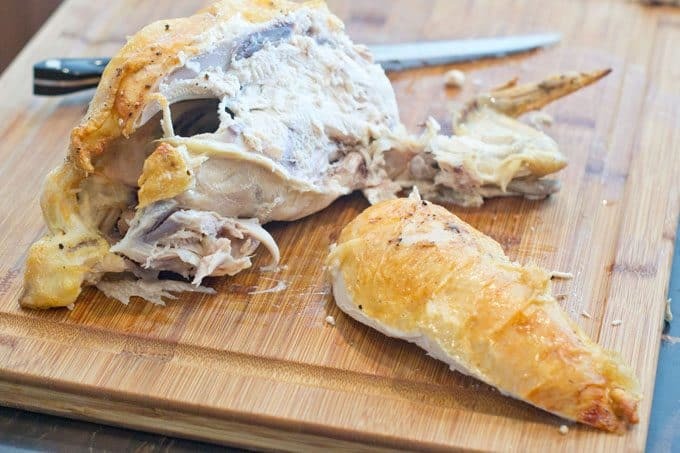 We at The Cookful love a good roast chicken. 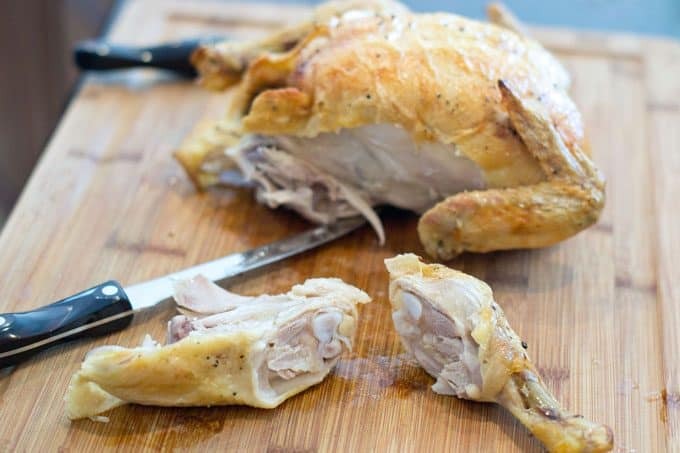 Slather on some oil, add a few shakes of salt and pepper and pop it in the oven (check out our basic roast chicken recipe at the bottom of this article). It’s one of the simplest meals and yet so comforting and delicious that it’s perfect for when friends come over too. You’ll only need two tools to do the carving. Today I chose to use a boning knife and a carving fork. 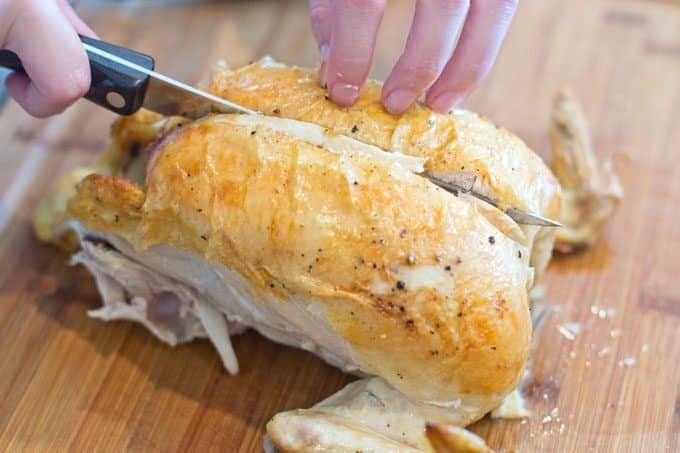 I chose a boning knife instead of carving knife because I am deboning the chicken and then carving. 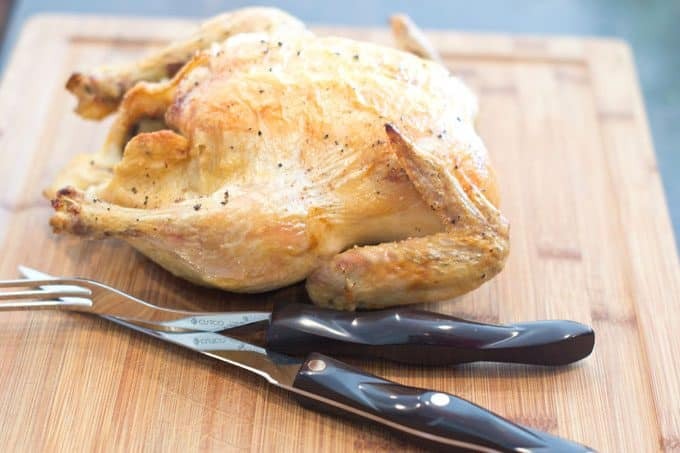 Place your roasted and rested chicken on a cutting board. 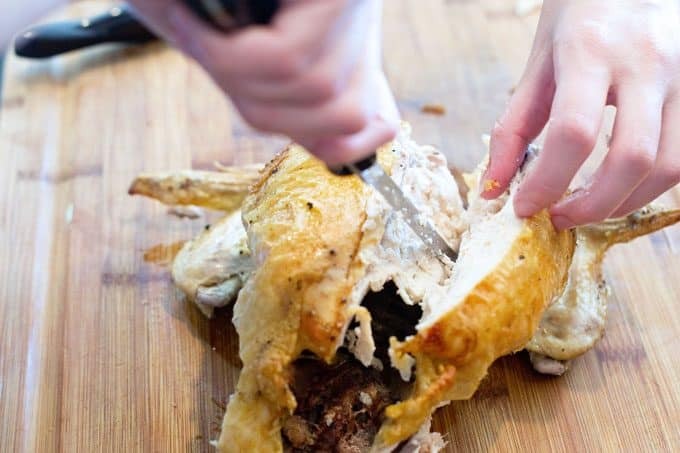 Using your knife, cut in-between the thigh and breast. There is a little pocket of air you will feel and know where to cut between both. Follow the cut along the thigh and breast. 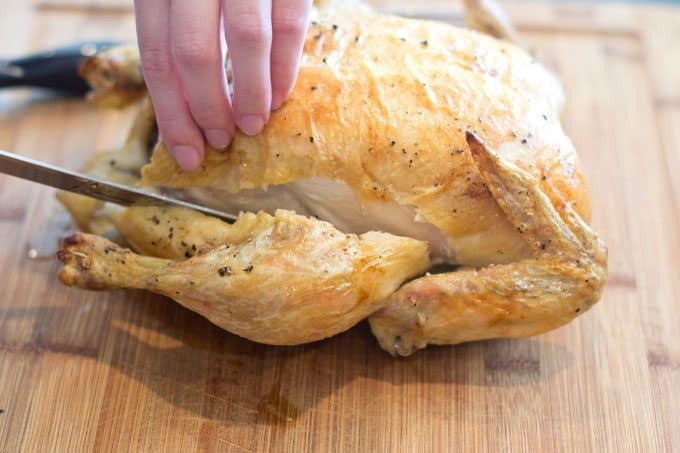 Using your hands pull the thigh and leg loose from the chicken body and repeat with the other side. 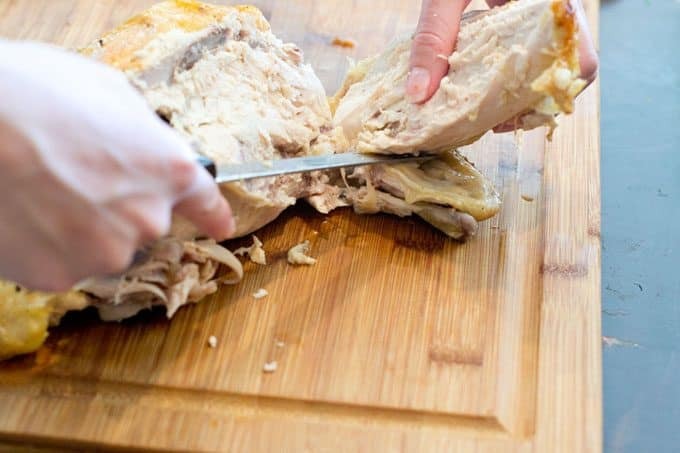 Use your knife and cut between the thigh and leg bone at the joint. To find the joint, move the leg and watch where it hinges. The cut should look like this. Repeat with the other leg. Now it’s time to move on to the breast. Locate the breast bone in the middle of the breast and cut on both sides of the bone. 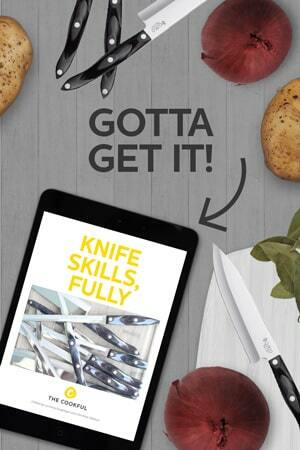 Use your boning knife to slowly cut the breast from the ribs using short strokes from the tip of the blade. 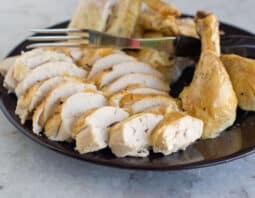 Disconnect the breast from the chicken. Repeat with the other side. The skin should still be intact with the breast. 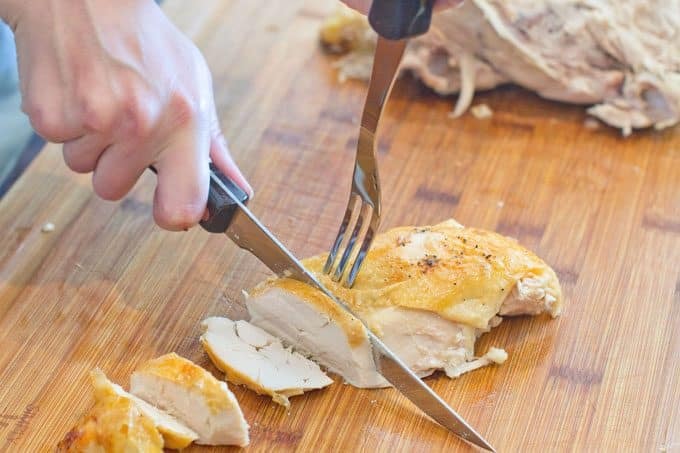 Holding your carving fork and knife, slice the chicken breast. Disconnect the wing from the chicken. Repeat on the opposite side. 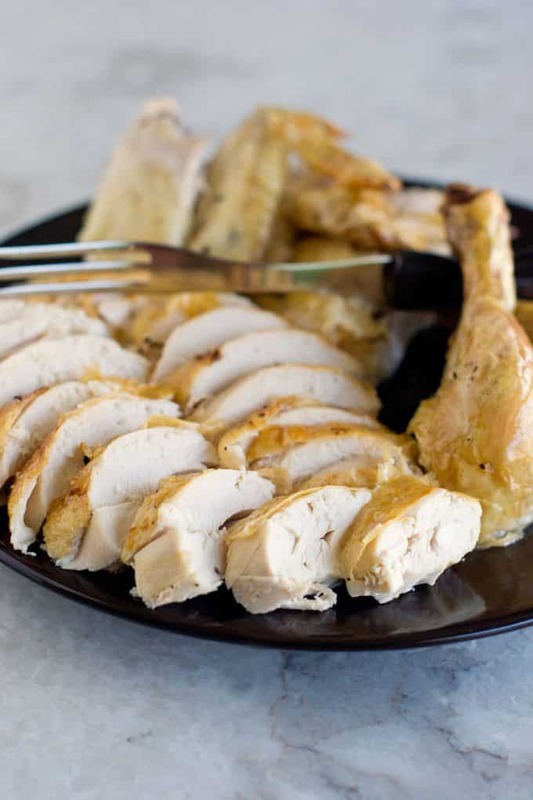 Transfer the chicken slices and pieces to a large plate or platter to serve. 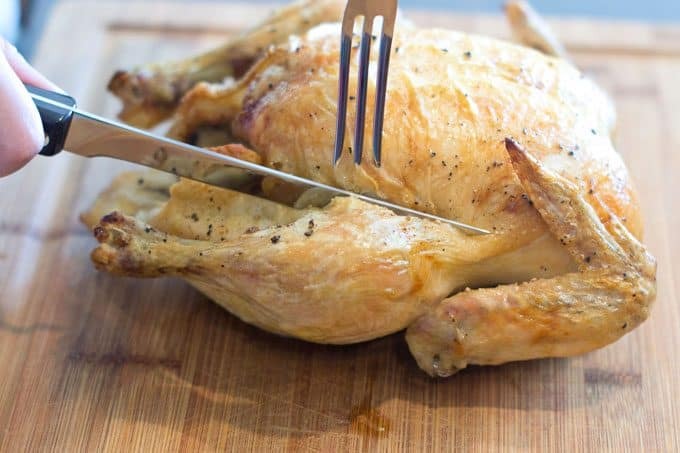 If you’re looking for a basic roast chicken recipe to carve up, scroll down. Our favorite roast chicken recipe is down there. Preheat oven to 400°F. Place chicken in roaster and rub with olive oil, salt and pepper. Bake until internal temperature (taken in the middle of the thigh with an instant-read thermometer) reaches 165°F, about 90 minutes. 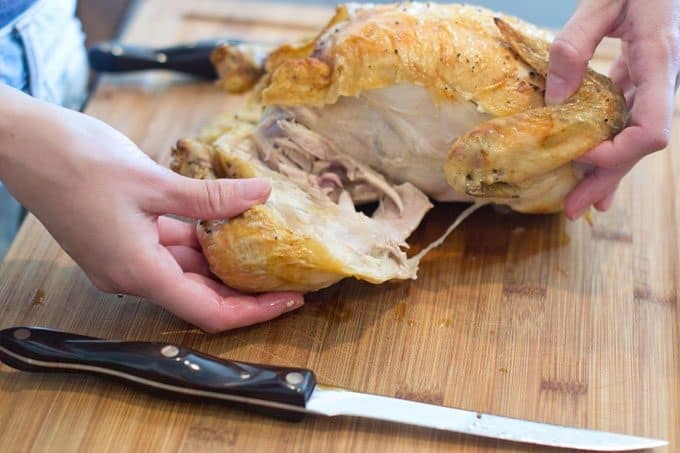 Let chicken rest 15 minutes before carving. 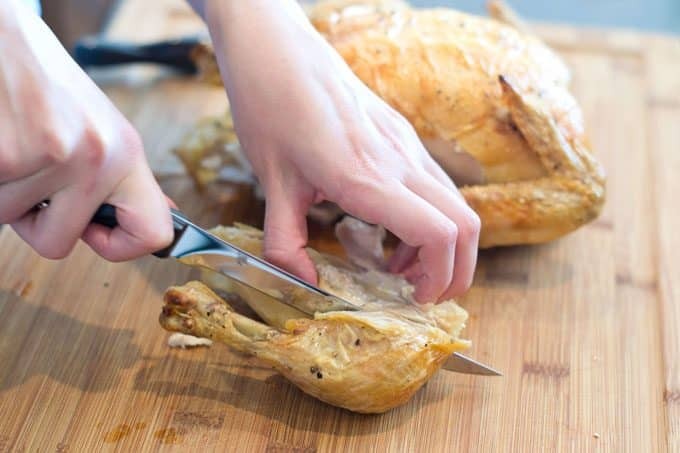 Using your knife, cut in-between the thigh and breast and follow your cut. 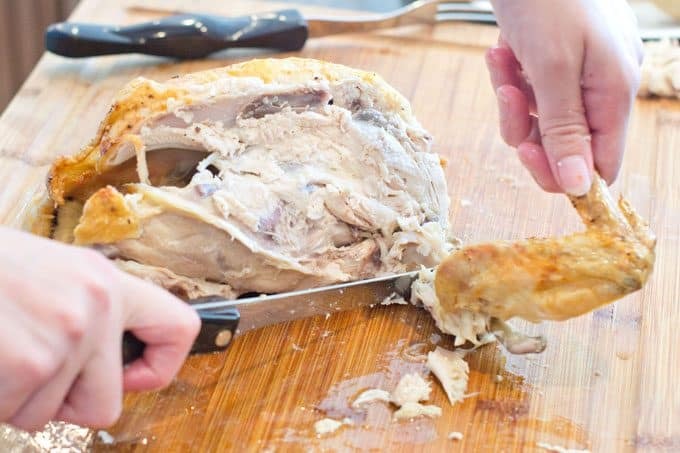 Using your hands pull the thigh and leg loose from the chicken body and repeat with the other side. Switch back to your knife and cut between the thigh and leg bone. It’s easy to find if you move the leg and watch where it hinges. Repeat. Locate the breast bone in the middle of the breast and cut on both sides of the bone. 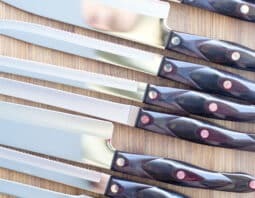 Use your boning knife to slowly cut the breast from the ribs using short strokes from the tip of the blade. Slice the breast. Repeat. Disconnect the wing from the chicken. Repeat on the opposite side. Transfer chicken pieces and slices to a large plate or platter to serve.